Frank Lautenberg, a long time senator, who rose from humble circumstances in Paterson, passed away at the age of 89, in NewYork-Presbyterian Hospital. Mr Lautenberg who returned to the city in February to announce his retirement was one of the main backers of the national park status for the Great Falls. During that event the octogenarian told reporters of the hardship endured by his father while working at a silk mill in Paterson. He told a reporter that his father wanted him to get an education so that he would not have to work inside factories. Mr Lautenberg after serving in World War II went to college to attain a degree in economics from Columbia University, which indeed saved him from working in factories, but also made him a millionaire, after he worked with a few boyhood friends to expand Automatic Data Processing or ADP which has become the preeminent payroll processing company in the world. He was born in the Silk City on January 23rd, 1924, to immigrant Jewish parents from Eastern Europe. Growing up as a boy his family was so impoverished that they could not hold a bar mitzvah for him. Mr Lautenberg was also the senator who pushed through a national drinking age restriction, setting the age at 21, in 1984. A law that saved thousands of lives. He passed laws that made the country a better place than how he found it in 1982 when he was elected to the US Senate. His legislative accomplishments are impressive and far too many to list. 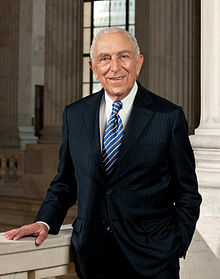 Mr Lautenberg died of viral pneumonia at 4:02am in NewYork-Presbyterian Hospital on Monday, June 3rd, 2013.